Short sell strategies are an important part of stock trading systems for most profitable traders. A selling short strategy is a valuable tool in neutral and bearish market situations. There are even asset management firms that only selling stocks short – they use only bearish trading systems. Short stock strategies could be based on several different ideas. The quite popular idea is to use some parameters of fundamental analysis to check whether shares are a good pick to short a stock. Fundamental analysis studies many different economic parameters and values available from companies’ financial reports. It can be hard to study them in details. So the best way is to make the selection process simple. And I like simple ideas, they are the most powerful. Investors consider that a value of 50 and higher is quite a high price to earnings ratio. These companies often trade at prices that have nothing to do with actual business performance. Investors are often betting on company’s the future. These expectations often fall short and such situations offer opportunities for quick and big profit. There are many different screeners available online for fundamental screening. 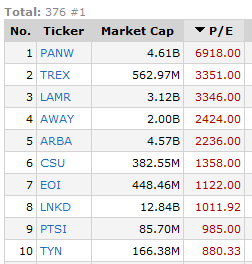 Here you can see the results of a screener available on FinViz or ChartMill sites producing a list of companies that have a P/E ratio above 50. The price to earning ratio does not tell you when to sell stocks using a shorting order. You have to use other indicators and trading tools to define the best points when to sell short stocks. These tools can be based on some additional fundamental catalyst like change in revenue growth. Another good fundamental warning point is to check if a good earning ratio is not only set by cutting expenses. Usually it is only a matter of time before earnings of such company start to deteriorate. It is often also good to check technicals. A ticker in strong uptrend is not a good option for trade right now. The best way is to wait for some sign of weakness or trend change. Best sell short strategies also incorporate best risk management rules. It is crucial to set rules for maximum risk and maximum possible losses for any particular short stocks trade. Perfect knowledge of how to sell short a stock and use stop loss and profit taking orders is very important for profitable short sell strategies. Best traders can confirm this.